We’d love your help. Let us know what’s wrong with this preview of Following Hadrian by Elizabeth Speller. One of the greatest--and most enigmatic--Roman emperors, Hadrian stabilized the imperial borders, established peace throughout the empire, patronized the arts, and built an architectural legacy that lasts to this day: the great villa at Tivoli, the domed wonder of the Pantheon, and the eponymous wall that stretches across Britain. Yet the story of his reign is also a tale One of the greatest--and most enigmatic--Roman emperors, Hadrian stabilized the imperial borders, established peace throughout the empire, patronized the arts, and built an architectural legacy that lasts to this day: the great villa at Tivoli, the domed wonder of the Pantheon, and the eponymous wall that stretches across Britain. Yet the story of his reign is also a tale of intrigue, domestic discord, and murder. To ask other readers questions about Following Hadrian, please sign up. From the title I expected the whole book to be a travelogue of the philhellene Emperor Hadrian's many journeys through the empire. This was not quite accurate. Epigraphs began each chapter, alluding to the theme of each, then excerpts from the [fictitious] memoirs of Julia Balbilla, friend of Hadrian's disliked, if not hated, empress, Sabina. Julia accompanied them on their travels. 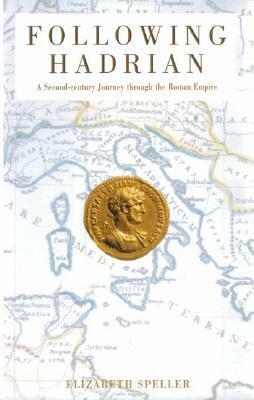 There was a good deal of history and well-written info dumping, discussion of sites in Rome and ruins of those in From the title I expected the whole book to be a travelogue of the philhellene Emperor Hadrian's many journeys through the empire. This was not quite accurate. Epigraphs began each chapter, alluding to the theme of each, then excerpts from the [fictitious] memoirs of Julia Balbilla, friend of Hadrian's disliked, if not hated, empress, Sabina. Julia accompanied them on their travels. There was a good deal of history and well-written info dumping, discussion of sites in Rome and ruins of those in other parts of the Roman empire and much speculation on what might have happened, since there is not much primary source material on Hadrian. The book did present Hadrian as a very complicated man, capable of kindness and of cruelty and coldness when it suited him. He could hold grudges for decades, at real or imagined slights and had a terrible quick temper. I did get a better picture of his personality. Picked it up at Tsewong's in Xiahe. Read it in two days. An engaging reminder that the classical world was not limited to the greek polis. Multi-ethnic empire building old skool style. Hadrian was a truly interesting chap. And I learned that the collossi of Memnon only sang for something like 250 years--a much shorter time than they've been silent. This was a rather uneven biography of Hadrian, the emperor who ruled Rome from 117 to 138 AD. The beginning, I felt, was strong and full of interesting details of Hadrian's early life: his provincial upbringing, adoption by Trajan, marriage to Sabina (a loveless marriage), and development into the warrior and intelligent ruler he became. At about the midpoint, the whole topic of Antinous came up and the author never really moved on. She seemed to be obsessed with this young man that Hadrian kept This was a rather uneven biography of Hadrian, the emperor who ruled Rome from 117 to 138 AD. The beginning, I felt, was strong and full of interesting details of Hadrian's early life: his provincial upbringing, adoption by Trajan, marriage to Sabina (a loveless marriage), and development into the warrior and intelligent ruler he became. At about the midpoint, the whole topic of Antinous came up and the author never really moved on. She seemed to be obsessed with this young man that Hadrian kept as a lover. Antinous died in a tragic accident and she repeatedly discussed his untimely death and the strange details surrounding it. While I think it was a pivotal moment in Hadrian's life (his life definitely took a turn for the worse after this event), I don't think it needed such extensive analysis and focus. Sadly other details of Hadrian's life seemed to be missing, the biggest example being Hadrian's Wall. The only fact I knew about Hadrian before reading this bio is that he built a wall. I was hoping to learn more, but it was not to be. The author only mentioned it once in passing and made no effort to explain how and why it was made. Another weakness of this biography was the fictional story that is spread out over the book in small sections. It is Hadrian's life viewed through the perspective of a noblewoman who was close friends with his wife. I think it was supposed to bring Hadrian to life more, but it was very poorly written in wooden, cold prose and didn't really seem to add much of anything other than bulk to the book. In fact, I was often confused and left wondering what parts were based on facts and what parts were purely from the author's imagination. Hadrian was a man with many gifts. He was intelligent, well-read, very athletic, a successful soldier. He had an excellent memory, liked poetry, and was a gifted architect and builder. The remnants of his impressive villa are still standing, a testament to his architectural savvy. He accomplished a lot during his rule, traveled across his massive empire extensively, restored ancient buildings (the Pantheon being one), and presided over a relatively peaceful and stable time in Rome's history. (One of the main exceptions of this peacefulness being when he ruthlessly drove the Jews out of Jerusalem, thus completing the diaspora of the Jewish people.) Despite his intellectual gifts and immense wealth and accomplishment, he never found happiness and satisfaction. The last years of his life were spent in dissipation, despair, and mental breakdown. He sought peace, safety, and contentment, but never found it, because he never looked to the only One who can provide that. Ultimately his life was a tragic one and he died an unloved and extremely depressed man. I started this while walking Hadrian's Wall, and then put it down for quite some time before finishing it. I enjoyed it but there wasn't much about the Wall! it is more about his life overall, particularly the later years. Which I knew nothing about, so I learned a lot. I really failed to be aware of its omission. And given the context it may not be an omission at all. What was served was gripping enough. you consider to be 'normal' or consider to be obvious or natural. The influence of a nation's mythology on everyday behaviour is a factor that may leave an ignorant stranger floundering without even being aware they are. Hadrian's culture, status, sexuality and beliefs are all brought into play in what we might have expected to be a fairly straightforward account of a life. Luckily it becomes a fascinating journey into realms unknown. Hadrian was supposed to have written an autobiography, which can both reveal and obscure,for instance either through the extremes of pride or humility, so answers/facts become muffled creating more confusion. Politically Hadrian stopped the drive to expand the Empire and set about the more realistic and peaceful job of consolidating what the Empire already had. His love of the Hellenic led him to emphasise these values in all its expressions, especially in building and extending cities and Hellenic culture in every part of the Empire. Unfortunately this led to the second major bloody clash with Judaism and the final diaspora which does more than echo today!! and put a huge dent in Hadrian's Peace Agenda. All this was carried out through fairly constant travel, a passion of Hadrian's which occupied over half of his reign. His huge retinue must have been a double-edged sword to his subjects when it descended on their lives and lands. A wife and an accompanying young lover was a personal sidedish, which especially came to the fore when the young man was drowned in the Nile. But was he a suicide, a murder victim or a myth being reenacted? Was he even young ? Was Hadrian responsible as well as bereft? Was the lover responsible and doing his duty? Speculation can be even more fascinating and informative than a true story. This is a truly absorbing read. Each chapter begins with a brief relevant quote from a Roman poet or writer, which is followed up by a much longer extract from the fictitious( which does not have 'false' as an opposite!!!) diary of a Greek princess, Julia Baibilla, who was a companion to Hadrian's wife, the Empress Sabina, on these travels. Finally we have a substantial discussion of the facts, the possible facts and the detective work becomes engrossing. No Wall here, but it is still there in England's far cool north, compliments of Hadrian, the traveller and builder. PS. Marguerite Yourcenar's acclaimed 1951 "Memoirs of Hadrian"...her version of the Lost Autobiography, lies on a shelf beside a hopefully not too conventional historical study,"Hadrian and the Triumph of Rome"
that I would LOVE to "walk Hadrian's Wall". I'd been close to it a few times at Carlisle, but NEVER seen it. And then I became a bit disabled walkwise. A few vertebrae had thinned and lost the jelly between them. And another vertebrae had become misaligned. So I'm 'reading' Hadrian !!! with renewed interest. I picked this book up thinking that it would be a travelogue, following some of Hadrian's peregrinations. It isn't. In a way it's more than that, it's a consideration of Hadrian's philhellenism and how that affected his attitude to ruling an empire. Mainly it is concerned with the visit to Greece and Egypt in 128-130CE and how the mysterious death of his lover Antinous changed him and quite possibly his plans for the Empire. I'm not a Roman scholar, or even anyone with more than a general knowled I picked this book up thinking that it would be a travelogue, following some of Hadrian's peregrinations. It isn't. In a way it's more than that, it's a consideration of Hadrian's philhellenism and how that affected his attitude to ruling an empire. Mainly it is concerned with the visit to Greece and Egypt in 128-130CE and how the mysterious death of his lover Antinous changed him and quite possibly his plans for the Empire. Hadrian remains a mysterious historical figure, definitely complex and very human, and yet, it seems like historians have decided to concern themselves mainly with Hadrian's Wall and his general presence in Britain. This despite the fact that Hadrian has left behind a very significant architectural legacy. Speller focuses mainly on Hadrian as an emperor and as a human being, realizing that by examining who he was, we can also evaluate his tangible legacy in much more efficient way. Hadrian seems Hadrian remains a mysterious historical figure, definitely complex and very human, and yet, it seems like historians have decided to concern themselves mainly with Hadrian's Wall and his general presence in Britain. This despite the fact that Hadrian has left behind a very significant architectural legacy. Speller focuses mainly on Hadrian as an emperor and as a human being, realizing that by examining who he was, we can also evaluate his tangible legacy in much more efficient way. Hadrian seems to have struggled in a way humans tend to, even today: longing for something he never had, feelings inadequacy and, of course, the realization and denial of our own mortality. I was disappointed that there is hardly a mention of Hadrian's trip to Britain or his ordering a wall built across the island. I would have been interested in knowing his reasoning. The best parts of the book were the excerpts from the dairy of a travelling companion of Hadrian's wife. Her words provide an interesting insight into the mindset of the upperclass. judging by this book, the sources on Hadrian must be pretty thin. every other chapter is told from the point of view of a woman who was close friend of Hadrian's wife, and thus touring the empire with them. Not what I was expecting in a history. Perhaps my expectations were off, but it was not my kind of book. I liked this book and it made me feel what life was like during Hadrian era. But in the last chapters it talks too much about Antinous, with too much speculation on the facts.